Yes, I flinch when a bee buzzes too closely to my head, since I've been stung before and it startles me. There was that hornet the other day that spooked me, but I won't apologize because those things hurt. Stings I've received were not by those insects that most people probably think of when hearing the word bee, that's the one that makes honey. The only times I was stung by honeybees happened when I was a tyke, and asked for it. Honeybees are a stumbling block for baryons-to-beekeper evolution that give silent testimony to creation. 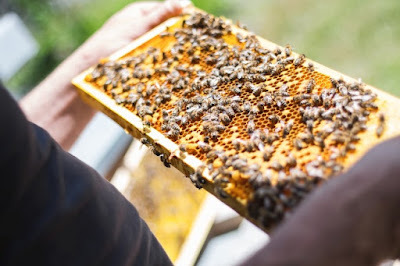 Did you know that the hexagonal shape they use for the hive is mathematically the strongest and most efficient design? Odd that they know that, isn't it? Plants need bees, and bees need plants — and we need bees to keep a big part of our food supply going. The honey they make is also very beneficial for us. Then there's the very intricate system of the hive, with the scouting, communication, gathering pollen, honey manufacturing process, breeding, and more. Honeybees are troublesome for evolutionists to explain, but biblical creationists have no difficulties, accepting that they are a blessing from our Creator. We’ve all heard the phrase “busy as a bee.” The aptly named worker bees literally work themselves to death. In the barren winter, they may live several months, but in the work season when flowers are blooming, they may die after only a few weeks outside the hive. Their lives are cut short from the rigors of flying—sometimes dozens of miles each day. During its frenetic working lifetime, a single worker bee may add merely one-twelfth of a teaspoon of prized honey to its colony. Yet the power of the bee is in the cooperation of the colony. Together, an industrious colony may produce 150 pounds of honey during a year’s warm season. Bee-have yourself and read the rest of the article by clicking on "Honeybees: One of God’s Sweetest Designs".